Rice fields outside of Guiyu. If you want to see where your old electronics go to die, take a trip to Guiyu. For two decades, PCs, phones and other electronics have been shipped to this town on the southeast coast of China, where locals in thousands of small workshops pull them apart with buzz saws and pliers to extract the valuable components inside. By all accounts, it's a toxic nightmare. Historically, the recycling has been done with little regard for health or safety, and toxic substances routinely leak into the air and water. No wonder it's been called one of the most poisonous towns on earth. But things may finally be changing. I spent two days in Guiyu last week, and while the smell of shredded metal still hangs in the air, efforts are underway to clean the place up. Some of the most dangerous activities, like using acid to burn metals from circuit boards, are being moved to an industrial park to the north. "Things are getting much better in Guiyu, although there are still problems," said Du Huanzheng, an environmental expert who's been studying the town for seven years. When I arrived last week I half expected to find one big landfill under a cloud of smog, but when I stepped off a bus at the edge of town I was surprised to see clear blue skies and even patches of lush green fields. At first I wondered if I was in the right place, but after I'd walked past a few main roads and reached the back streets and alleys the smell of recycled electronics hit me. The first thing I saw was a giant stack of plastic frames outside a block of buildings. Looking closer, they carried brand names like Sony, Acer and Dell and had once been the backs of monitors. Now they were stripped down, smashed up and packed together in piles over five feet tall. It was a sight that repeated itself throughout the town. All around were heaps of old computer mouses, keyboards and smartphone casings, discarded power supplies and printed circuit boards. Piles of the stuff were wrapped in plastic, stuffed in bags or laying in the street outside people's homes. It's easy to call it trash, but the discarded electronics are the livelihood of many in this town of about 200,000, which sits near the coast about 200 miles northeast of Hong Kong. As I walked the streets I saw residents sitting in their homes, processing piles of e-waste around them. Some of the apartment buildings look like concrete warehouses several stories high, with the doors open for all to see. Some inhabitants used small circular saws to cut memory and CPU chips from motherboards, others prised components from PC power supplies with hammers and their bare hands. In one residence, over a dozen workers picked through baskets of feature phones in assembly line fashion. One man tore off the casings and batteries, while others used tweezers to pull chips from tiny circuit boards. Some of the e-waste is foreign, brought in illegally from neighboring Hong Kong and through the Chinese city of Guangzhou. But increasingly, environmental experts say, the waste originates from China itself, now the world's biggest market for PCs and smartphones. Cargo trucks roar in and out of town, ferrying the parts to be recycled. And everywhere is the sound of metal and plastic being shredded, the tools buzzing in unison like a giant lawn mower. The smell is nauseating and a reminder of how dangerous electronics recycling can be. Without proper safety equipment, the workers are exposed to lead, tin and toxic hydrocarbons. "We all rely on the recycling to make a living," said a woman who picked apart PC power supplies in her home. The work is hard, she said, and the income small. The workers often make around 100 yuan ($16) for working 10 hours a day. "Everyone wants to be healthy," she said, "but we also have to raise a family." Despite the dangers, Du said Guiyu is significantly cleaner today than it was several years ago. A sign posted by a small stream in the town declares that Guiyu will crack down on any "acid cleaning, and burning activities." Residents said it's rare now to see "board burning" in the town itself. "You want to get rid of the pollution, but you also want to maintain the lives of the 200,000 people," said Du, who has been working with the Chinese government to address the environmental issues. The efforts include moving some of the recycling to an industrial park to the north of town that formally opened last year. Dealers gathered in a market there last week, selling chips torn from old products. Some of the processors will be reused in toys and electronic greeting cards that play music, Du said. Still, it will take another five years to clean up Guiyu and for better recycling practices to take hold, he estimates. 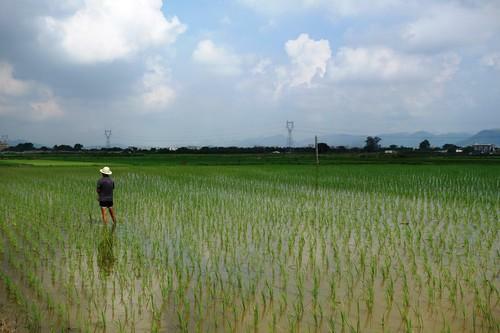 One farmer, surnamed Cheng, said the conditions in Guiyu have improved. He's been growing rice on the outskirts of town for five years and said confidently that the local water is clean. But though his rice paddies looked green and healthy, I was skeptical. A study published just last month found that children in Guiyu still have abnormally high levels of lead in their blood. The industrial park, while small, is trying to expand and modernize the local industry. More than 5,000 small recycling businesses operate in Guiyu itself, according to the park's website, and given the world's appetite for electronics, that number only seems likely to grow. "More of the recycling businesses here are hiring people from outside of town," the farmer said. "Some will hire 100 people." Wandering around town, I was reminded that millions of Chinese work in factories every day producing smartphones that are shipped all over the world. The jobs pay little by western standards and the hours are long, but the workers still come in droves, hoping to make a better living than they can in the countryside. In China, even if the work is hard and dirty, there's always someone willing to do it. And Guiyu is another reminder of that.